This article is about the town in Wales. For the similarly named town of Newquay in Cornwall, see Newquay. For other uses, see New Quay (disambiguation). 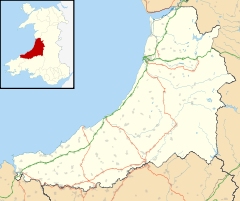 New Quay (Welsh: Cei Newydd) is a seaside town (and electoral ward) in Ceredigion, Wales with a resident population of around 1,200 people, reducing to 1,082 at the 2011 census. Located on Cardigan Bay with a harbour and large sandy beaches, it lies on the Ceredigion Coast Path, and remains a popular seaside resort and traditional fishing town. Until the early 19th century, New Quay consisted of a few thatched cottages surrounded by agricultural land, the natural harbour providing a safe mooring for fishing boats and a few small trading vessels. The New Quay Harbour Act was passed in 1834 and a stone pier was constructed at a cost of £4,700. Trading activity increased and new houses were built as economic migrants arrived. Shipbuilding began to take place and the town increased in size with the construction of terraced housing up the slopes of the sheltered bay. By the 1840s, more than three hundred workmen were being employed in shipbuilding in three centres, New Quay itself, Traethgwyn, a bay just to the north, and Cei-bach, a pebble beach further north below a wooded cliff. Here were constructed not only smacks and schooners for sailing along the coast, but also larger vessels for sailing to the Americas and Australia. At that time, as well as shipwrights, New Quay had half a dozen blacksmith shops, three sail makers, three ropewalks and a foundry. Most of the male inhabitants of the town were mariners or employed in occupations linked with the sea. By 1870, shipbuilding had ceased at New Quay but most of the men living there still went to sea. There were navigation schools in the town and many of the last square riggers that sailed the world were captained by New Quay men. The observant tourist can still see the old warehouses, now put to new uses, lengths of chain, metal rings and capstans, and a list of tolls for exports and imports can still be seen outside the harbourmaster's office. New Quay Golf Club (now defunct) first appeared in 1909. The club and course closed in the mid 1920s. There are a number of available publications about the town's history and residents. New Quay is the name of the electoral ward which is coterminous with the community. Since 1995 the ward has elected one county councillor to Ceredigion County Council. Independent councillor Gill Hopley represented the ward until the May 2017 elections when she was beaten by Independent candidate Dan Potter. At the local level New Quay is represented by 10 town councillors on New Quay Town Council. Key attractions for holidaymakers include the picturesque harbour and expansive sandy beach, as well as the ability to see the population of bottlenose dolphins that lives in Cardigan Bay. The town has a heritage centre and marine wildlife centre, as well as the usual collection of shops and restaurants. Nearby New Quay Honey Farm, the largest bee farm in Wales, has a live bee exhibition and sells honey, mead and beeswax. The outskirts of the town feature many large holiday parks and caravan sites. As well as shops, banks, restaurants and pubs, New Quay has a large primary school, a doctors' surgery, a small branch of the county library service and a fire station. New Quay Lifeboat Station, operated by the RNLI, houses two lifeboats: a Mersey class named Frank and Lena Clifford of Stourbridge in dedication to its main benefactors and an inshore inflatable D class. In 2014 the station celebrated 150 years of service, during which period it made 940 callouts. Public transport is provided by regular bus services to Aberaeron, Cardigan and Aberystwyth. The town has never had a train service, as schemes to open routes to Cardigan or Newcastle Emlyn were abandoned in the 1860s, and that from the Aberaeron to Lampeter branch line (the Lampeter, Aberayron and New Quay Light Railway) was never completed due to the First World War. A few miles outside New Quay is a honey farm. There is a public park at the top of New Quay next to a tennis court. New Quay is one of several places in Wales to claim a link with writer Dylan Thomas, who lived on the cliffs in a bungalow called Majoda from September 1944 until May 1945. Accordingly, the town is often cited as partial inspiration for the fictitious village of Llareggub in Under Milk Wood. Thomas had previously visited the town when he and Caitlin had lived at Plas Gelli, Talsarn, in 1942-43; his New Quay pub poem, Sooner than you can water milk, dates from this period. He also had an aunt and cousins living in the town. Much of the location filming for The Edge of Love, a 2008 film based around Thomas and starring Sienna Miller and Keira Knightley, was carried out in and around New Quay. Dylan Thomas' principal patron in the area was Thomas Scott-Ellis, 8th Baron Howard de Walden, whose summer residence was Plas Llanina, an historic manor house perched atop the cliffs at Cei Bach next to the tiny church dedicated to St Ina. He allowed Thomas to use the old apple house at the bottom of the manor's walled garden as a quiet place in which to write. The town has played on its connections with Thomas to attract visitors in recent years through, for example, the creation of the Dylan Thomas Trail which maps the poet's links with the area. Plas Llanina has quite a chequered history including some interesting owners and various stories associated with them. By the end of the 18th century it had passed into the ownership of the Jones family, the last of whom was Edward Warren Jones. When he died he left the Llanina Estate to his two godchildren, Mrs Charlotte Lloyd (of Coedmore) and her younger brother, Charles Richard Longcroft. Charlotte and Charles had lived with Edward Warren Jones as children after the deaths of their parents, Capt. Edward Longcroft (d. 1812) and his wife Elizabeth (d. 1809). Indeed, Charles had been born at Plas Llanina while Captain and Mrs Longcroft were living with Mr Jones; there were local rumours that Charlotte and Charles were actually fathered not by Edward Longcroft but by Edward Warren Jones, but this is unsubstantiated. ^ a b "Town and ward population 2011". Retrieved 13 May 2015. ^ Jenkins, J. Geraint. Ceredigion: Interpreting an Ancient County. Gwasg Careg Gwalch (2005) pg. 63. ^ a b Jenkins, J. Geraint. Ceredigion: Interpreting an Ancient County. Gwasg Careg Gwalch (2005) pg. 64. ^ "New Quay Golf Club", "Golf's Missing Links". ^ (1) S. Passmore (2012) Farmers and Figureheads: the Port of New Quay and its Hinterland, Grosvenor House. (2) R. Bryan (2012) New Quay: A History in Pictures, Llanina Books. (3) W. J. Lewis (1987) New Quay and Llanarth, Aberystwyth. ^ "Ceredigion County Council Election 2017: The Results". Cambrian News. 5 May 2017. Retrieved 20 November 2018. ^ "Council". New Quay Town Council. Retrieved 20 November 2018. ^ "Cardigan Bay Regatta in its 126th year". New Quay Yacht Club. Retrieved 4 February 2008. ^ "New Quay Fleet". RNLI. Archived from the original on 28 September 2008. ^ "New Quay RNLI mark 150 years of service". Wales Online. Retrieved 4 July 2014. ^ See D N Thomas (2004) Dylan Remembered 1935-53, vol 2, pp285-313, Seren, as well as S. W. Rhydderch (2015) Ceredigion Coast: Llareggub and the Black Lion in A Dylan Odessey: 15 Literary Tour Maps, ed. S. Edmonds, Literature Wales/Graffeg. ^ Sooner than... is reproduced on p189 of D.N. Thomas (2000) A Farm, Two Mansions and a Bungalow, Seren. Wikimedia Commons has media related to New Quay. Wikivoyage has a travel guide for New Quay. This page was last edited on 6 December 2018, at 08:22 (UTC).